What Is Best Way to Reduce High Cholesterol Easily? When talking about how to reduce high cholesterol naturally – using lifestyle changes – it often involves quite a bit of change. Some would say – extreme change! But a new study in the Journal of the American Heart Association shows that one, tiny little diet change per day can make a huge impact on your cholesterol level. Canadian researchers reviewed 112 previously published randomized controlled trials that replaced their subjects’ animal with plant proteins for three or more weeks. They found that the substitution of just one to two animal proteins per day reduced LDL cholesterol, other non-high density lipoprotein cholesterol, and apolipoprotein B, a cholesterol component that has also been linked with heart disease. 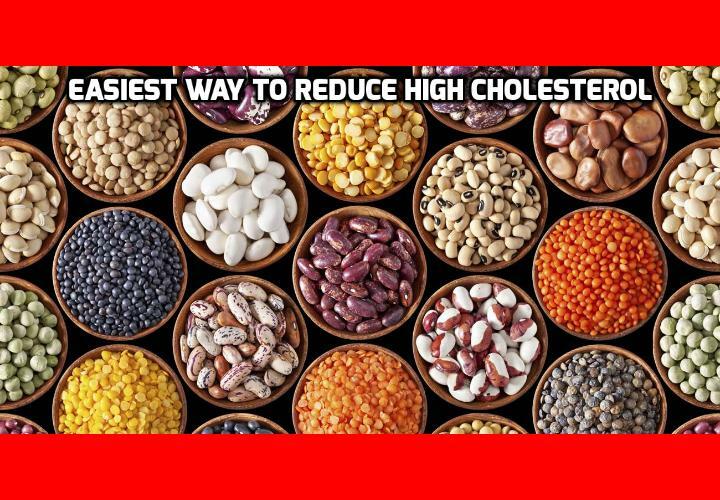 The lead author recommended that we should enhance the effect by combining plant proteins with other cholesterol-lowering foods like oats, barley, psyllium, viscous, and plant sterols such as those in grains, vegetables, fruits, nuts, and seeds. Many foods are also artificially fortified with plant sterols. The author also suggested that you could obtain the best plant proteins from soy, nuts, peas, beans, lentils and chickpeas. You don’t have to stick to only two substitutions per day, of course; the more, the better. Replace dairy milk with almond, cashew, or soya milk in your cereal and hot beverages throughout the day. Replace your butter with nut butter. Eat bean or lentil stew instead of meat stew. Instead of pieces of barbecued or grilled meat, rather use vegetarian substitutes made of textured vegetable protein. They can be just as easily added to stir-fries. If you replace all or most of your animal proteins with plant proteins, you must pay a bit of attention to ensure that you obtain all the necessary amino acids. Animal proteins contain all amino acids, but most plant proteins contain only some of them. That is why it is best to obtain your plant proteins from different plants, not just from one or two alone. But there are some plant proteins that contain all the amino acids, such as soy, tofu, tempeh, edamame, quinoa, buckwheat, Ezekiel bread, seitan (wheat gluten), Chia seed and hemp seed (both a bit low in lysine), rice and beans combined, Hummus and Pita combined, or even the old classic, a peanut butter sandwich. In fact, every time you combine legumes and grains, you have a complete protein with all the necessary amino acids. This post is from the Oxidized Cholesterol Strategy Program created by Scott Davis. He once suffered from High Cholesterol so much that he even had a severe heart attack. This is what essentially led him to finding healthier alternatives to conventional medication. The program is highly focused on eliminating one simple ingredient you consume every single day, an ingredient you had no idea you were even putting it your body. What’s scary is that this ingredient isn’t even listed on the label of many common food choices. It’s terrifying stuff! So, this system starts you off with valuable information about this one simple ingredient, what it’s doing to your body and what you can do about it. But it doesn’t end there. The Oxidized Cholesterol Strategy goes on to teach you a wide range of diet, fitness, lifestyle, exercise, sleep and eating tips that will help you maximize your results. More importantly, these tips will help completely clean out any plaque build-up in your arteries. To find out more about this program, go to How to Reduce High Cholesterol Level. Previous PostPrevious What Did Research Say on This Weird Arthritis Heart Attack Link? Next PostNext What Can Terribly Happened If You Have High HDL Cholesterol?